Florence Fay School Senior Apartments is the renovation of an iconic school building to fill an unmet need for senior housing in an aging neighborhood. Located in the Twin Aire neighborhood in Indianapolis, the development serves area seniors through the creation of 73 units of quality affordable housing in a centralized location. The rehabilitation converted the vacant Indianapolis Public School, Florence Fay School No. 21 into housing through the creative reuse of the 65,203 square foot school along with 24,557 square feet of new construction. Formerly an anchor of the neighborhood, the deteriorated school was renovated to create 53 unique units of housing, while the new building added 20 more of these high quality units. One hundred percent of the 73 units are affordable, handicapped accessible or adaptable, and serve seniors aged 55 and better. Built in 1913, School No. 21 was named after Florence Fay, who lived from 1853 – 1912. Florence was a beloved teacher and principal, but her biggest impact was made in her pioneering efforts that brought civic improvements such as sidewalks, street lights, and running water to the previous school building and “suburban” neighborhood. For over a decade Florence Fay School sat empty, slowly decaying – a structural and economic burden to her community. 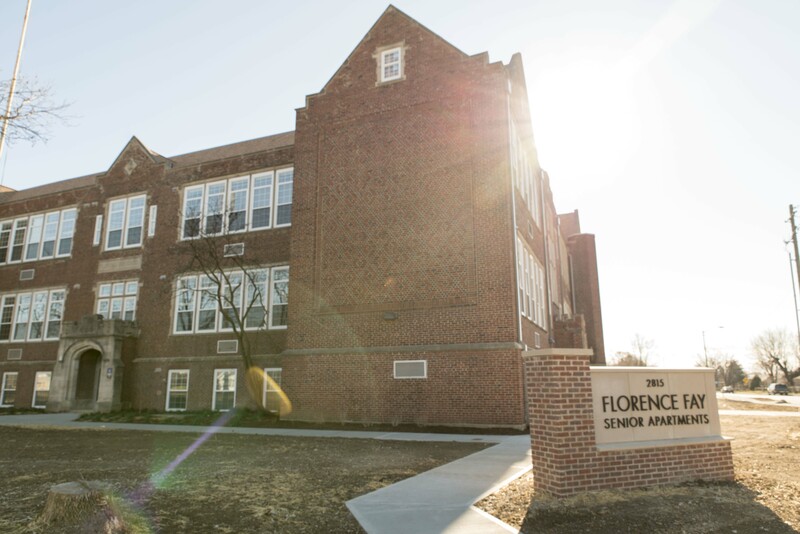 Now, 103 years later, Florence Fay School Senior Apartments once again pioneers significant investments to her neighborhood and their families. The completed community features a reading room, community room, and the existing gym serves as a recreational space for large gatherings. Less than a 2 block walk/bike ride to the Pleasant Run Greenway, perhaps no other affordable housing site in Indianapolis is better connected to parks, recreation and fitness opportunities for tenants. The other innovation for NDC is that this project represents our first foray into providing a Proprietary LIHTC Fund, having only one investor, which is Morgan Stanley. This was accomplished through a unique partnership with the National Equity Fund, a LISC affiliate, and Morgan Stanley. NDC CEF created a fund called NDC Corporate Equity Fund SP I, LLC; a pass through entity where we were able to raise over $13.5 million that were invested into the project.